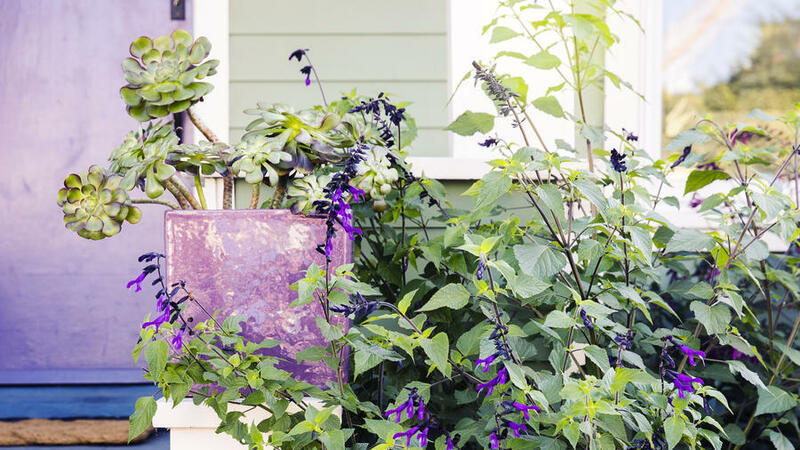 Next month's front-yard makeover, featuring "Amistad" salvia and (at bottom) Purple Pixie loropetalum from the Sunset Western Garden Collection. April showers bring May flowers—and shrubs, and ornamental grasses, and every other plant in the Sunset Western Garden Collection. We’re prepping for our spring planting extravaganza in the upcoming April issue, so to one lucky reader we’re giving away $1,000 worth of SWGC plants that have been custom-selected for that reader’s specific Sunset climate zone. Whether you live in the mountains of Colorado, the deserts of Arizona, coastal Oregon, or elsewhere in the West, a Sunset Western Garden Collection representative will work with you to tailor a new look for your yard. To enter this contest, comment on our Facebook post with a note about how you’d transform your garden with plants from the Sunset Western Garden Collection. Be sure to tag @SunsetWesternGardenCollection and a fellow gardener. The person with our favorite comment will win the prize package! Read the full contest rules below, then get over to Facebook and enter! The contest begins at midnight on February 20 and ends at midnight on March 12, 2017. 1. HOW TO ENTER: This contest begins 12:01 A.M. EST on Feb 20, 2017 and ends 11:59 P.M. EST on March 12, 2017. To enter online, go to sunset.com/plantcontest and follow instructions to participate on Facebook. Entrants must comment on the specified Facebook post with a comment about your plans for using Sunset plants to transform your garden, and tag another Facebook user in that comment. The comment must also tag @SunsetWesternGardenCollection. Entries by postal mail will not be accepted. Limit one entry per person. Sponsor is not responsible for lost, late, illegible, incomplete, or entries not received for any reason. Entries become sole property of Sponsor and none will be acknowledged or returned. By entering, Entrant warrants that his or her entry (1) is original and does not infringe the intellectual property rights of any third party, (2) has not been published in any medium or (3) has not won an award. Facebook is neither a cohost or a sponsor of this promotion. 2. JUDGING: All entries will be judged by Sunset editors based on the following criteria: Appropriateness to Contest Theme (25%); and Creativity of written description (75%). In the event of a tie, an additional “tie-breaker” judge will determine the Winner from among all such tied entries using the judging criteria above. Incomplete and/or inaccurate entries and entries not complying with all rules are subject to disqualification. Decisions of judges are final and binding. Winner will be notified underneath their comment on Facebook by March 17, 2017. 4. PRIZES AND APPROXIMATE RETAIL VALUE: One Winner will receive $1,000 worth of Sunset Western Garden Collection plants; if Winner resides in a location where Sunset Western Garden Collection plants are not available, a gift card of equivalent value for a local nursery will be awarded. All other expenses not specified herein are the responsibility of the Winner. ALL TAXES ARE THE SOLE RESPONSIBILITY OF THE WINNER. The prize is awarded without warranty, express or implied, of any kind.